A small cafe with a simple outdoor setup that’s pooch-friendly, Eddy’s Cafe is all about unwinding with simple food — for you and doggo. Plus, they host comedy nights and gigs too! Eddy’s Cafe laidback vibes make it the perfect spot to chill with your pupper and friends. The simple patio seating is pet-friendly and perfect for doggo dates or even human dates when you want to soak in some of that evening breeze. A classic cafe fare of breakfast, sandwiches, nibbles, and coffee set the scene for this neighbourhood hang that could easily become our favourite spot. Who doesn’t love a space that lets in dogs too. 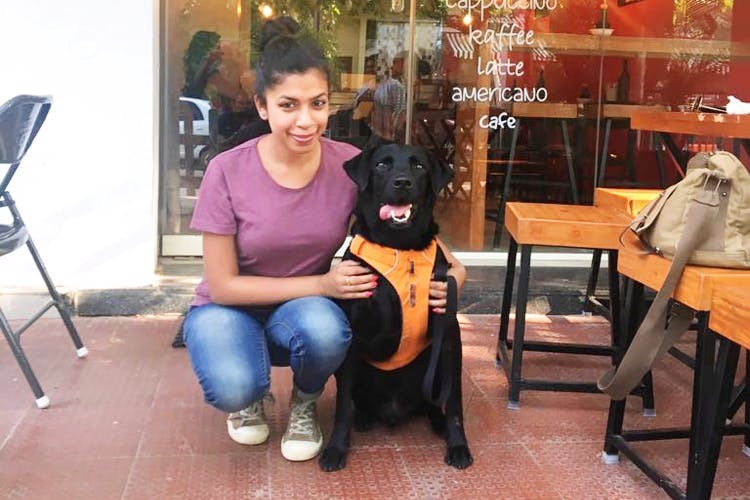 The owner, Sunil, who’s named the cafe after his late doggo, absolutely adores the furry customers and while there isn’t a set pet menu, he can whip up anything that’s dog-friendly on the fly; omelettes with no salt and pepper, and milk-soaked bread, you get the drift right? Oh, do say hello to the resident doggo, Freddie. He’s usually curled up near the entrance full from all the chicken bones he’s had. The cafe’s laidback vibes also work for all you folks who are always working out of a cafe. There’s free WiFi and corner spots available, should you like a bit of privacy while working. Order a round of nibbles such as Chicken Wings (save the bones for Freddie), Potato Cheese Croquettes, and Loaded Nachos to go along with your cuppa of coffee or tea (they have green tea too). Sandwiches are of the sourdough kind. A shoutout to the BBQ Pulled Chicken sandwich. The cafe is hosts musicians on Monday and comedians on Thursdays for open nights.